Jochen in his home studio. Weaving teachers are such an important part of the weaving community—not only do they help create new weavers, but they help those of us who are already happily weaving expand our skills and our knowledge. Good weaving teachers are patient, kind, and inquisitive. Handwoven’s Co-Teacher of the Year (Sponsored by Halcyon Yarn) Jochen Ditterich is all that and more. He’s also full of wisdom and extremely funny. When I called Jochen at his home studio he was immediately warm and friendly. I could tell immediately why his students loved him so much! 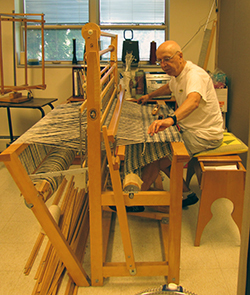 Jochen, who was born in Germany and learned to weave in Finland, has been a main stay in the Michigan weaving world for decades, and he’s taught by his estimations over a thousand students. There’s a lot more to Jochen’s story, which you can read in the upcoming March/April 2016 issue of Handwoven, and we’re all very proud to call him our Weaving Co-Teacher of the Year along with Joyce Robards. One of the parts of my job I love the most is meeting and getting to know weavers and weaving teachers from around the world. I love seeing their beautiful weaving and hearing their stories. Even better are the times when I get to share these things with you!